It may be hard to explain to someone living in the southern zones how any gardener could get excited about such a humble, and downright sour, vegetable. But after four or five months of cold, snow covered ground (beautiful though it may be), the first edible growing plants to show their faces are bound to be special. And rhubarb is at the top of the list here. 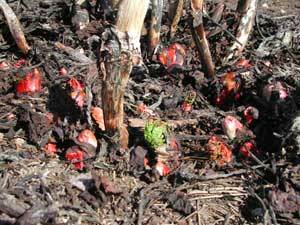 Rhubarb's wonderful dark pink heads start emerging from the winter packed mulch as soon as the snow recedes. It announces the promise of Spring with such beautiful design and is watched carefully though it needs nothing from the gardener. We can taste the first batch of rhubarb sauce long before the stalks are large enough to harvest. Of course, you don’t have to live in snow country to appreciate rhubarb, but it does require a cool climate to thrive, needing a cold period of dormancy. Last year I tried to hurry a plant along by putting a cold frame over it before the snow had melted. But rhubarb is such a hardy soul that the plants outside the cold frame kept pace with the one within -- it didn’t need such pampering. The stalks are the edible part of the rhubarb, of course, the leaves having poisonous levels of oxalic acid. Though classified as a vegetable or herb, I consider it as a fruit because that’s the way I use it. It’s the only fruit that is readily available from spring through fall, and it has to be one of the hardiest and easiest to grow. Though the plants, and hence your harvest, will be bigger and more lush if you give your plants some extra care, they can also get by with minimal attention if need be. As a child I had often enjoyed a stalk of rhubarb while playing outside, pulled from a neglected patch of plants growing around an outbuilding. The stalks were usually thin, but I don’t recall wanting anything larger. You can buy rhubarb roots, but it’s usually easy to get a chunk of root and crown from anyone with plants, just ask around. We got our first roots when we bought a used tractor from a couple who had just dug up a long row of rhubarb, wanting to get rid of it. After chaining the tractor on the trailer for its trip to our place, they happily added several bushels of roots. And, of course, we planted them all. As we didn’t have a place in our new garden, we dug them into the field sod along the fence, in the middle of summer. 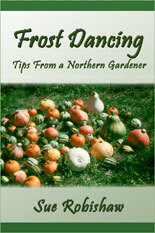 In spite of such poor treatment and soil, they grew and gave us many years of harvest -- much more than we could use. Rhubarb seed doesn’t come true to type, and in my experiments is not very viable, so it is almost always propagated by dividing the root ball. When we moved our garden, I transplanted five plants into an old garden bed. The rhubarb responded to this kindness by producing large harvests of thick, juicy stalks -- more than the 25 plants had before. It’s amazing what a little good soil can do. Feed your soil, and the plants will feed you. Occasionally I spread a little compost on the plot in the late fall, if I have extra, and once in a while a few forkfulls of mulch, but mostly the rhubarb takes care of itself. The five plant patch has thrived for almost 20 years and is still going strong, though it is now a separate island in the grass. A few times I dug out a shovel-full of root when I noticed the stalks getting thinner and crowded-thick, filling the space with compost and garden soil. We’ve eaten many meals from this small plot. One of my favorite attributes of the rhubarb plant is that it doesn’t need weeding. How can you not like a plant like that! The large, spreading leaves are self-mulching -- while growing and as they die. When I harvest the stalks, I break off the leaves and tuck them under the plant. 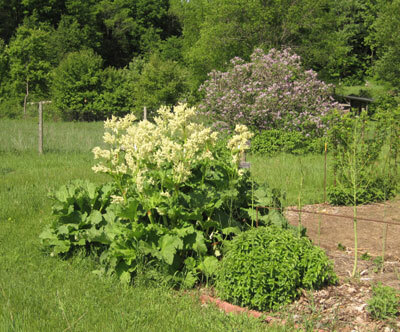 Occasionally a stubborn perennial weed might get a toe-hold, but if the rhubarb is planted about three feet apart, it will form a nice thick mulched area. It certainly doesn’t hurt, however, to give it a little help by adding some additional mulch. 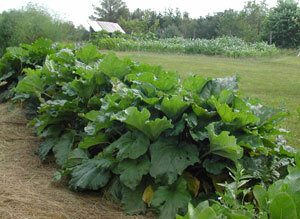 The mulching aspect of rhubarb makes it great as a barrier plant. For years my plants easily kept the grass out of the compost bins, which were along one corner edge of our permanent bed garden, between the garden and the field. The rhubarb was planted along the outer side of the bins. We simply mowed along their outer edge and they kept the field from encroaching into the compost bins and garden. The rest of the perimeter between field and garden needed to be kept tilled or hoed to keep the grass back. A major garden renovation a few years ago (making it wonderfully smaller) ended with a long expanded plot of rhubarb and asparagus along the entire east side of the garden. I simply dug and transplanted large shovel fulls of rhubarb root into its new bed in late fall, mulching it well with hay. By the next fall it was well established, productive, and self mulching. If you plant small root pieces, you’ll need to wait until the plant is producing good, strong, large stems before harvesting much, to give it a chance to get well established. Though rhubarb is often thought of as a spring crop, and maybe most appreciated then, we harvest and use it through the summer as well. It’s our main “fruit” source between the last of the dried apples in the spring and the first of the fresh apples in late summer, supplemented with the various berries as they arrive. In mid-summer when the rhubarb stalks start getting spongy and the leaves yellowing, I go through and pull off all the older, past-prime, yellowing stalks, leaving the fresh, younger stalks and leaves. This seems to re-vigorate the plants and they produce a second flush of harvestable stems. You don’t want to harvest all of the stalks at any time, of course -- the plant needs a supply of leaves to feed its roots. I harvest thumb size and larger stalks, leaving the smaller ones to supply the plant. If you pay attention to your plants, you’ll know if you’re taking too much. But it’s a very generous soul, so with just a little extra care, you’ll have a good harvest. It’s generally advised to keep the flower stalks picked, which can be a job in itself with a good and healthy patch! But most years I let them flower -- the bees love them, and it’s worth the possibility of maybe shorting my own harvest a bit to add to theirs. Plus the white sprays are attractive in their own right. I cut the flower stalks when the bloom is done and seed forming. The plant is thankfully quite hardy and seldom bothered with insect pests or diseases. Rhubarb sauce is easy. Cut up a supply of stalks, add a little water and sweetening, and simmer until soft. Now the downside of rhubarb is that it does take a fair amount of sweetening to be comfortably palatable. Our favorite is maple syrup, but we also use honey and brown sugar. When other fruits start bearing the rhubarb mixed in helps extend those harvest and adds a great deal of flavor, especially to a mild fruit like blueberries. But strawberry-rhubarb sauce is probably our favorite. The sauce can be used in many ways, eaten for itself or as part of another dish or desert, simply or elegantly complicated. We use it most often, alone or mixed with other fruit, with raw or cooked rolled oats, sunflower seeds, raisins, nuts, for our breakfast meal. It's also good over fresh baked whole grain biscuits! Or mixed with yoghurt. A palatable rhubarb wine can be made, as well as a delicious jam if not over-sweetened. You can freeze it or can it. You can even dry it though i wouldn't recommend that (all you get are hard little sour pieces that reconstitute into mushy little sour pieces with little flavor). But it doesn’t need such extra work anyway as it is so easily available fresh for such a long stretch. It can’t be beat as a quick and lively pick-me-up when eaten raw right from the garden -- quenching many thirsts and custom made for summer working-in-the-garden snacks.